Gideon Levy: U.S. Criticizes Settlements While Giving Israel “Carte Blanche” to Continue Occupation | Democracy Now! Haaretz columnist and a member of the newspaper’s editorial board. 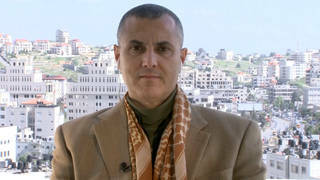 He is author of The Punishment of Gaza. an attorney based in Palestine. She has served as a legal adviser to the Palestinians in negotiations with Israel. She was previously an adviser to Palestinian President Mahmoud Abbas. AMY GOODMAN: Our guests are Diana Buttu—she’s in the studio in Haifa, a Palestinian attorney. Budour Hassan is joining us by Democracy Now! video stream from Jerusalem, a Palestinian student and writer. And Gideon Levy is also with us, Haaretz columnist, in Tel Aviv. NERMEEN SHAIKH: In an appearance at Harvard University, Secretary of State John Kerry appeared to draw a link between the wave of violence and increased Israeli settlements in the occupied West Bank. SECRETARY OF STATE JOHN KERRY: Unless we get going, a two-state solution could conceivably be stolen from everybody. And there’s been a massive increase in settlements over the course of the last years. Now you have this violence because there’s a frustration that is growing—and a frustration among Israelis, who don’t see any movement. So, I look at that, and I say, you know, if that did explode—and I pray and hope it won’t, and I think there are options to prevent that—but we would inevitably be—you know, at some point, we’re going to have to be engaged in working through those kinds of difficulties. So, better to try to find the ways to deal with it before that happens than later. NERMEEN SHAIKH: That was Secretary of State John Kerry speaking Tuesday. Gideon Levy, could you respond to what he said and give us a sense of what the mood there is? GIDEON LEVY: Unfortunately, I must say that John Kerry’s declaration is rather hypocritic. The Americans could have prevented long time ago; the Americans know exactly how to prevent it. If they really wanted to put an end to the occupation, the Israeli occupation would have come to its end long time ago. This policy of only serving carrots to Israel, of flattering to Israel again and again, is now decades long and never worked, never, ever worked. And the Americans never really tried the alternative path of putting pressure on Israel in order to bring Israel back to the international law, back to legal and order, back to morality. And now John Kerry is saying that this can be prevented and should be prevented? Where were you in the last 67 years, in the last 48 years, when Israel is so much depending on the United States like never before, and you just gave Israel a carte blanche to go wild in Gaza, in the West Bank, again and again, build settlements, go for wars, and never tried to push Israel and to put an end to all this? So, really, with all the respect to John Kerry’s good intentions, this is not the way to deal with Israel after all those years. GIDEON LEVY: —because, you know, the Americans will not punish Israel for this. AMY GOODMAN: I want to bring Diana Buttu into—back into the conversation. Also, Netanyahu was speaking at the U.N. General Assembly saying that Israel will now negotiate with the Palestinians without any preconditions. DIANA BUTTU: But that is a farce. I mean, one of the things that Netanyahu has said over and over again is that he’s not going to stop any settlement construction, in fact that he’s going to continue it. And, in fact, this is what has actually happened. In addition, what he’s also said is that they reserve the right to continue to kill Palestinians. And so, while he indicates that he has no preconditions, in fact, it’s quite the opposite. But the issue is not whether there are preconditions, it’s whether the negotiations process actually works. And it doesn’t. I was part of the negotiations process. You cannot negotiate with one very powerful party, backed by a superpower—the United States—and a very weak party. We call that dictation. The negotiations have failed over the course of the past 22 years. And so, now is the time, rather than heading back to negotiations, which only serve to give Israel more legitimacy, only serve to give Israel more international recognition—in fact, more countries started recognizing Israel after the negotiations process began than before it—rather than going back to that process, which was failed and futile for Palestinians, there needs to be a different way. And this different way is to be pushing for boycotts against Israel, to be pushing for divestment, and to be pushing for sanctions, to be pushing for Israel to be held accountable under international law, and to be pushing for Israel’s isolation. All of those measures will work. But going back to a failed negotiations process will not. AMY GOODMAN: How does the Al-Aqsa Mosque fit into this, the current unrest? DIANA BUTTU: Amy, this is one of the reasons that we are seeing these latest round and latest wave of protests. If you just look back about a year ago, a year ago there was a very brutal Israeli attack on Gaza in which Israelis—in which the Israeli army killed more than 2,000 Palestinians, including more than 500 children. A hundred thousand Palestinian homes and businesses were demolished or destroyed, and still to this day remain unbuilt. Add to that this summer’s attacks by Palestinian—excuse me, by Israeli settlers on Palestinians, including the burning of a Palestinian home in the West Bank town of Duma that ended up killing an 18-month-old and his two parents. Add to that the Israeli measures to allow the Temple Mount Faithful, a group that actually believes in the destruction of the Al-Aqsa Mosque, allowing them onto the Al-Aqsa compound under the guise of religious freedom, when there is nothing involving prayer there at all, allowing them to be able to go there while simultaneously denying Palestinians and denying Muslims the ability to be able to go to their holy sites. This is exactly the recipe that the Israelis have been laying out time and again in order to spark another wave of protests or an intifada, what have you. And so, the issue of Al-Aqsa plays—is very central, but it’s not just Al-Aqsa, it’s all of the other measures that have been taken, as well. AMY GOODMAN: Diana Buttu, we want to thank you for being with us, joining us from Haifa, a Palestine-based attorney. Budour Hassan, who was joining by video stream from Jerusalem and a Palestinian writer, writes for The Electronic Intifada. And the Israeli writer Gideon Levy, a Haaretz columnist, joining us from Tel Aviv.